Tickets.com recognizes the value of capturing data – whether it’s high-level sales and event information or an individual patron’s online or in-venue experience. We provide the services and tools to help you monitor live event sales and inventory, track patron behavior, and manipulate ProVenue data for conducting in-depth analysis of your operations. 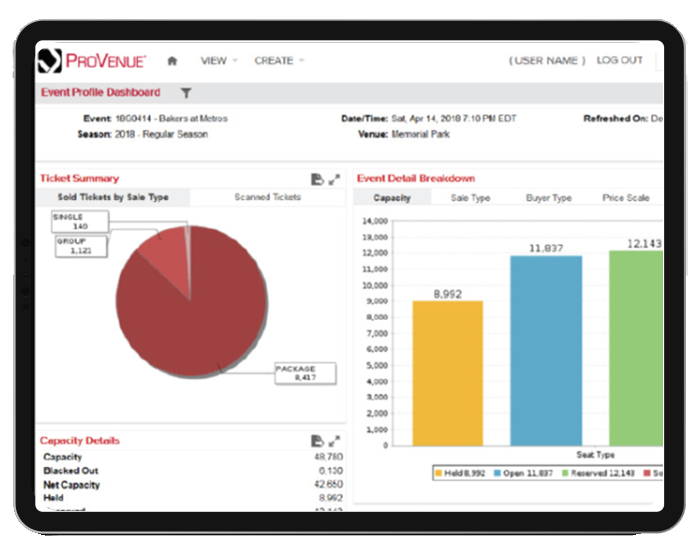 The ProVenue Reporting Portal offers a versatile alternative to running reports directly from within ProVenue. Run, schedule, and receive reports while operating outside of the Tickets.com Virtual Private Network. Optional design privileges allow custom reporting and data analysis using the Ad Hoc Designer. Using our integration with Google® Tag Manager, venues can measure the number of times a page is viewed, learn how patrons interact with account sign-up features, find trends associated with abandoned shopping carts, identify activities that result in completed transactions, and more. When you track patron behavior and buying habits, you can use this data to enhance your patron experience, intelligently target your marketing efforts, and increase your ticket sales. Tickets.com offers a flexible data-replication solution that provides you with a complete copy of your ProVenue data, including additions, edits, and deletions, updated every 15 minutes. A carbon copy of your actual database tables is made available to you as an Oracle® database, leaving you free to explore your data with any number of custom reports and to build support for any number of integrations.